Model 409B 170MHz 4-Channel DDS Signal Generator. The 409B generates four independent, phase synchronous sine wave output signals and is programmable in 0.1 Hz steps from 0.1 Hz to 171 MHz. Programming is via an RS232 serial interface. Phase is 14-bit programmable and amplitude is 10-bit programmable. Internal memory can store a sequence of settings. The -AC option is available to enable users to step through settings using an external trigger. It is accurate to 1.5 ppm using the on board TCXO timebase or you can use an external timebase, There is also a /R option that provides a way to lock to and track an external 10MHz frequency input. A line powered AC adapter and SOF8_409 windows software on a CD are included. Model 425A 350 MHz DDS Signal Generator. The 425A generates sine, LVDS and LVCMOS outputs simultaneously and is programmable in 10µHz steps from 250kHz to 350MHz and includes an LVCMOS Prescaler and Divider for generating LVCMOS frequencies down to 2 Hz. The 425A is controlled by an RS232 serial interface. Phase can be programmed with 14-bit resolution. The Frequency is accurate to 1.5ppm when using the on board TCXO timebase or you can use an external timebase. It requires 5 VDC power. A Line Voltage AC Adapter is included. SOF8_425 windows software is also included. Model 408A 100MHz DDS Signal Generator. The 408A generates cosine, sine and ACMOS/TTL outputs simultaneously and is programmable in 1µHz steps from 100Hz to 100MHz. It is also programmable for FSK and CHIRP outputs. The 408A is controlled by an RS232 serial interface. 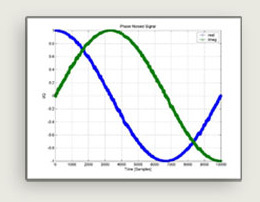 Phase can be programmed with 14-bit resolution.The Frequency is accurate to 1ppm when using the on board TCXO timebase or it can be factory configured to use an external frequency input as the timebase. A Line Voltage AC Adapter and a CD containing SOF8 windows softwareare included. A DDS8m is used inside the 408A. Model 440A 400MHz DDS Signal Generator. The 440A generates a sinewave is via an RS232 serial interface. The frequency is accurate to 1.5ppm and can be locked to an external frequency reference. The phase can also be programmed with 14-bit resolution. It includes a Line Voltage AC Adapter and a CD containing windows software. Model 2940A 2-Channel 400MHz DDS Signal Generator. The 2940A is a two-channel 400MHz DDS Signal Generator that generates two independent sine wave output frequencies simultaneously from 200kHz to 400MHz in 1Hz steps. A Clock Generator configuration with ECL or LVDS clock outputs is also available. The 2940A is lockable to an external frequency standard or is used with its internal TCXO. Optional internal amplifiers and 60dB step attentators available. Set all parameters with front panel controls and LCD display or by computer using the RS232 serial interface. All settings can be saved into non-volatile EEPROM memory upon power down. Windows software included. Model 2908A 100MHz DDS Signal Generator. The 2908A generates cosine and sine output signals simultaneously and is programmable in 1µHz steps from 100Hz to 100Mhz. The 2908A is also a Clock Generator with one ACMOS/TTL output. A built in function generator is programmable for FSK and CHIRP frequency outputs. The 2908A contains a 1ppm internal temperature controlled crystal oscillator (TCXO) or it can run from an external clock. The 2908A is controlled by an RS232 serial interface. SOF8 windows windows software is included. A DDS8m is used inside the 2908A.